Clark College, XPO Logistics, OEG, Inc., Cascadia Behavioral Healthcare, State of Oregon Dept. of Transportation, Multnomah County, Oregon Youth Authority, Peace Health, Department of Human Services, Albertina Kerr, City of Salem, Mt. Hood Community College, FBI, Salem Media Group, North West Regional ESD, Fully, Onpoint Community Credit Union, Chemeketa Community College, TSA, Enterprise Holdings, Oregon State Police, Oregon State Lottery, EC Company, Entercom, Oregon Health Authority, City of Beaverton, Les Schwab Tire Centers, EVRAZ North America, Oregon Department of Environmental Quality, WA Department of Licensing, AppleOne and MANY MORE!! ...will have hundreds of employment opportunities from entry to professional level available. Additional information available at http://www.citycareerfair.com. Avoid the line! Come on your lunch hour! 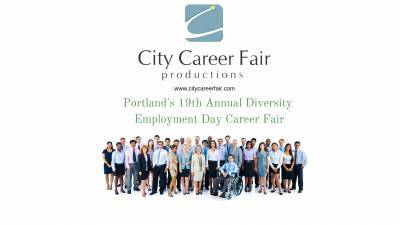 -- Email your Resume to FastTrack@CityCareerFair.com with the subject: PORTLAND and receive a confirmation code that allows you to skip the line!